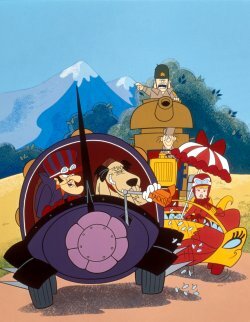 Dominating television animation for three decades, Hanna-Barbera’s infamous characters hold the fondest of childhood memories for the kids since 50’s. From careless, clumsy dogs to daringly devious mice, over the years we have seen plenty of loveable and amusing characters. 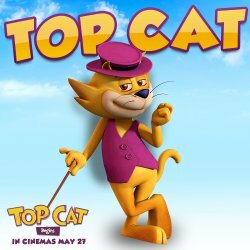 One of the most iconic of them all is everyone’s favourite feline friend, Top Cat, who is returning in brand new adventure Top Cat Begins in cinemas May 27th. To celebrate the return of him and all his furry friends, we are taking a look at some of the other wonderful characters that stand alongside Top Cat in the Hanna-Barbera hall of fame. First making his debut in 1958 as a supporting character in The Huckleberry Hound Show, Yogi Bear’s enormous popularity led him to become the first break-out character to be given his own show. 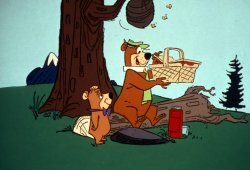 Like most early Hanna-Barbera characters, Yogi Bear was inspired by a TV character. Based on Art Carney’s Ed Norton character on American sitcom The Honeymooners, he is best known for his quirky catchphrases and, as he so modestly puts himself, being “smarter than the av-er-age bear”. Everyone’s favourite mischievous dog, Scooby Doo is a Great Dane, known for hilariously sharing many personality traits with his lifelong companion amateur detective Shaggy Rogers. He’s clumsy, unable to pronounce his words without placing an ‘R’ in front of them and perpetually hungry. But despite all that, he’s surprisingly human-like with intelligence that often solves the mystery the detectives are trying to desperately uncover. 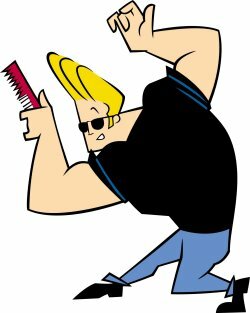 Muscular and boorish with strikingly blonde hair and an Elvis-like voice, Johnny Bravo sees himself as the ultimate ladies’ man (although the ladies seem to think otherwise). Confident in his efforts to try and get women to go on a date with him, his advances are quick to be rejected in the most comedic ways. 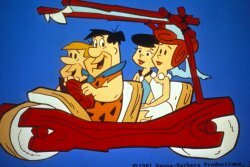 Loud-mouthed, aggressive and always scheming, deep down Fred Flintstone isn’t the boorish man he comes across as. With his heart in the right place, he is constantly looking for ways to improve his working class family’s life and give only the best to his beloved wife Wilma. It just so happens, that he hilariously loses his temper in all of his extravagant attempts to do so. 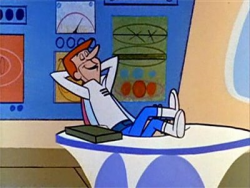 A slim man with bright red hair and a cartoonish large nose, George often finds himself muddled with juggling the stress of his work and family life. Constantly attempting to overcome the hassle in his life, he quickly became known for his infamous catchphrase, “Hooba-Dooba”, which he uses to express astonishment whenever a crazy series of antics unfold. Bashfully playing on the cat-and-mouse chase, Jerry is a prevalent protagonist to his enemy that happens to also be his best friend. 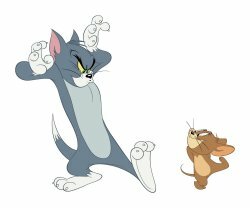 Teasing, torturing and tormenting Tom, Jerry causes the pair to find themselves in all sorts of mischief, stuck between being rampant rivals and having a bond as the unlikeliest of friends. Top Cat is the yellow-furred, charismatic protagonist who is the proud creator and leader of an infamous alley cat gang. Wearing a mauve hat and vest, his smart appearance cleverly hides that he was once a poor, lonely cat stuck living on the streets. Loyal to his formidable bunch, there’s an adventure waiting around every corner for the gang as they mischievously roam the streets of Manhattan.